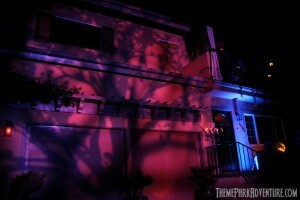 The House at Haunted Hill has become very special to Theme Park Adventure since we were introduced to it a few years ago. 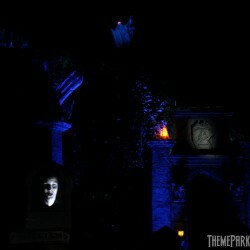 Definitely one of the most impressive home haunts in the United States (which then means the world, since no one does Halloween like we do), we look forward to this multimedia extravaganza each season, and it never disappoints! 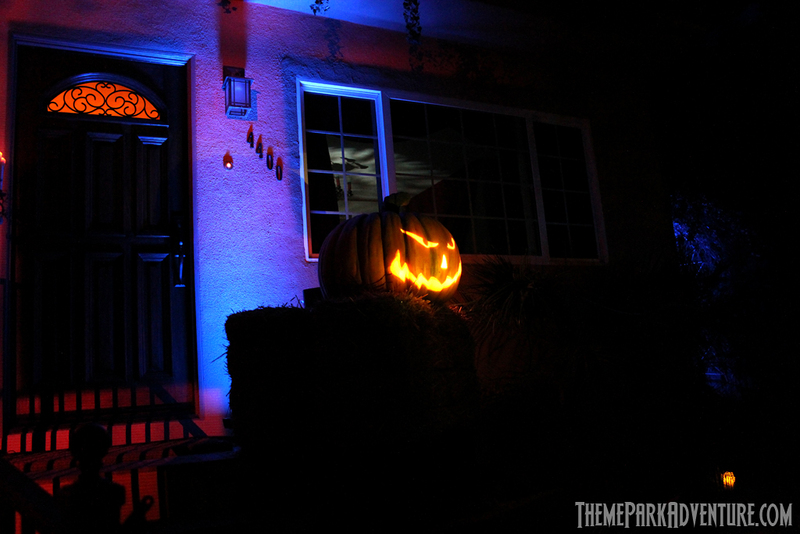 What began in 2000 as a simple home spooking-up (they all start out that way, don’t they) has turned into a massive show, complete with professional audio and lighting controls and a sweeping soundtrack narrated by voice actor Corey Burton. 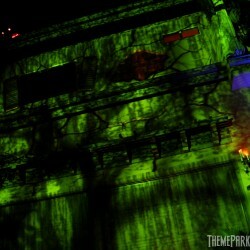 To say the current version of The House at Haunted Hill is epic is a huge understatement. The story of The House at Haunted Hill takes guests from present day to 1939, when up-and-coming film actress Julietta Larue married shady actor Billy Valentine, much to the chagrin of her friends and loved ones. During the flashback to 1939, guests come face-to-face with the spirits of the past, including Lily Valentine, Billy’s first wife who, along with their daughter, died… mysteriously, before he met Julietta. The vengeful Lily, who was buried on the grounds of the home, appears and frightens Billy away and claims a terrified Julietta, who in turn, becomes one of the eternal residents of the property. 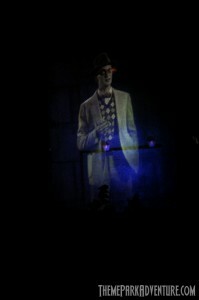 It’s a somewhat involved story that is likely lost on many guests who come each night and view the two-part production. However, the slick script written by Ed Valentine (an established screenwriter/playwright) is narrated so brilliantly by Corey Burton, I couldn’t and wouldn’t want it to be dumbed down or ever changed too much; it is written with such lyrical mastery that it’s damned near perfect as-is. Even guests not necessarily paying close attention to the spoken word get the sense as they stand there watching that the story is coherent and is being told in a very clever, nicely paced manner. 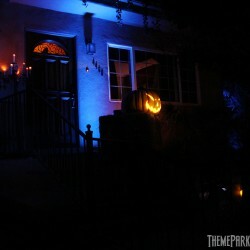 Backed by an outstanding musical score by composer Christopher Hoag, the written/spoken/musical elements of The House at Haunted Hill come together to make a world-class final product that is in a league of its own when it comes to home haunts. 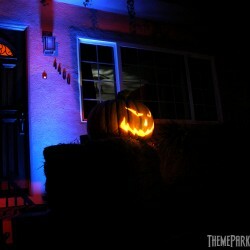 Make no mistake – the only reason we call this a “home haunt” is because it’s built at one in a quiet, cozy neighborhood in Woodland Hills, California, a short drive from Hollywood. 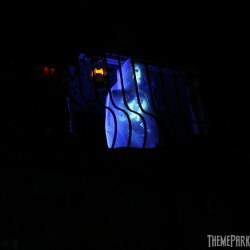 Other than being created for/at a private residence, there is absolutely nothing about The House at Haunted Hill that is in any way “amateur” other than a very few random props left over from the display’s early years. 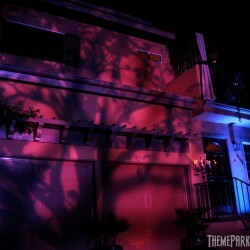 The quality of show and production involved here surpasses most pro haunts, and merges into the realm of professional themed entertainment. I’ve always written that this haunt reminds me of a cross between The Haunted Mansion and Twilight Zone Tower of Terror at the Disney theme parks. So what makes The House at Haunted Hill so incredibly high-quality and pro grade? The wizard behind the curtain is Matt Ford, an Emmy Award-winning lighting designer who has worked on such television productions as America’s Got Talent, Celebrity Apprentice, and Teen Mom for MTV. In addition to working on this years National Christmas Tree Lighting with his company Magic Lantern Creations, Matt has also toured with such musical icons as Whitney Houston and Diana Ross. In short, the boy knows what he’s doing! 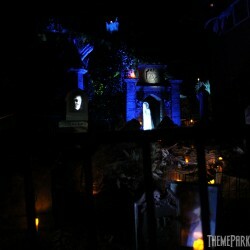 Thousands of fans and industry people flock to The House at Haunted Hill each year to see what Matt’s come up with. 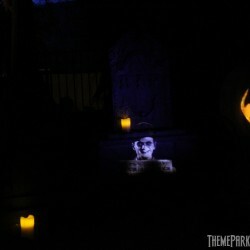 This year, the most notable addition was the inclusion of Neil Patrick Harris as ghostly reporter Snapper Bixby, a phantom from yesteryear that appears in various locations of the graveyard between shows to give lingering fans something new to see. Harris approached Matt after seeing the show and said he’d love to be part of it somehow. That is where the Snapper character came to be; it doesn’t alter the main story or take away from the show, so I personally have no problem with it. Some folks tend to get easily starstruck; I don’t, and so the celebrity that NPH brings to The House at Haunted Hill is really neither here nor there in my opinion. And, to their credit, both Matt and Neil have kept this on the down low, not honking it out much. 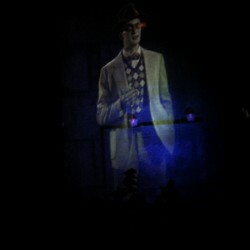 Snapper Bixby appears in various locations throughout the graveyard thanks to the magic of digital projection, and guests have a great time watching for him to “pop up” between shows. All in all, it’s a fun add to an already amazing production. 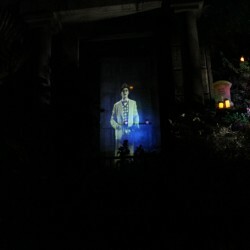 Other digital projection gags were also added to The House at Haunted Hill this year, and a few of the ghoulish props were moved to different locations. 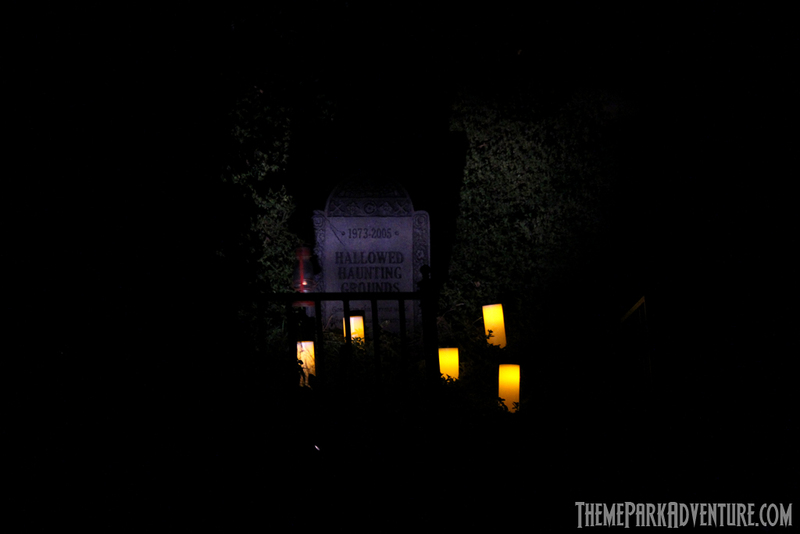 It was easy to see that Matt redid some of the graveyard and updated some of the scenic elements and props; in the past few years that we’ve attended this haunt, it’s never looked better. 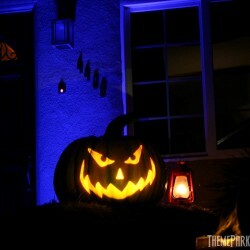 One of our favorite recent additions to The House at Haunted Hill is a cemetery plot dedicated to The Hallowed Haunting Grounds, which was the granddaddy of all Southern California home haunts from 1973 to 2005, owned by Gary Corb. Theme Park Adventure attended Gary’s home haunt for years, and when he retired it, some of the pieces went to Matt’s production in nearby Woodland Hills. 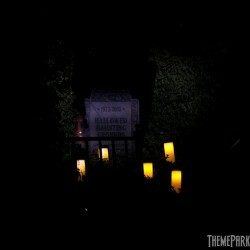 In fact, longtime home haunt aficionados with a keen eye will perhaps recognize a red lantern that floats in the air around the Hallowed Haunting Ground tombstone; this is in fact, the same lantern that thousands of guests gawked at when it did the same illusion in Gary Corb’s yard for so many years! 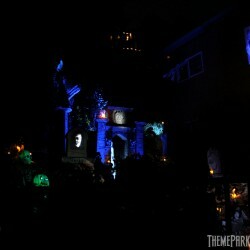 The House at Haunted Hill is a mix of nostalgic and high-tech spooky fun, suitable really for the whole family, as there are no “boo scares”, nor is the content of the show inappropriate for younger guests. This is a free haunt, but of course, donations are always welcome; obviously, a production of this scale isn’t cheap to operate. 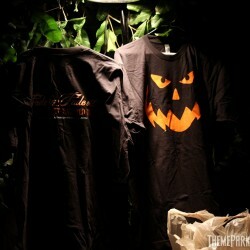 We were thrilled to find that Matt had House at Haunted Hill shirts available for sale this year! 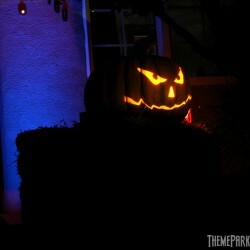 It seems that this year, more haunts are starting to get more aggressive and creative with their merchandise offerings. 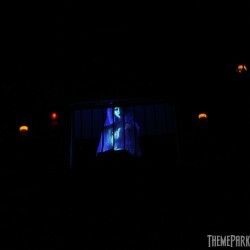 Not only does it bring in money to the operators, it’s a fantastic way to get advertising for these haunts out into the public eye. We encourage all of our TPAers to either donate or support these productions by buying and sporting their merchandise all year long. 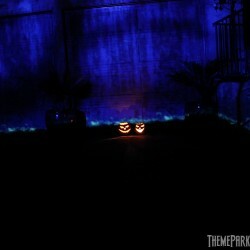 This entry was posted in Haunted Attractions, Home Page, Home Page Slider and tagged The House at Haunted Hill. Bookmark the permalink.